RAE Systems QRAE 3 Four Gas Monitor | Enviro-Equipment, Inc. Provides monitoring of Oxygen (O2), Combustibles (LEL), and toxic gases. Toxic gas options include Hydrogen Sulfide (H2S), Carbon Monoxide (CO), Sulfur Dioxide (SO2) and Hydrogen Cyanide (HCN). Available in Diffusion or Pumped version. Easy access to pump, sensors, filter and battery compartment. QRAE 3 is a wireless compact monitor for one to four gases. 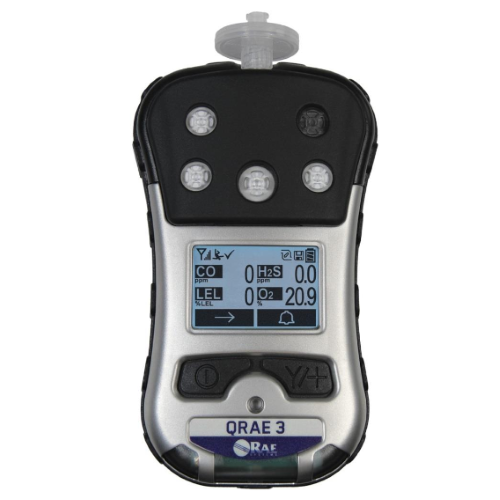 The QRAE 3 provides detection and monitoring of Oxygen (O2), Combustibles, and toxic gases that include Hydrogen Sulfide (H2S), Carbon Monoxide (CO), Sulfur Dioxide (SO2) and Hydrogen Cyanide (HCN). QRAE 3 can deliver wireless real-time instrument readings and alarm status 24/7. This provides better incident visibility and can improve response time. Large graphical display icon-driven user interface through intuitive, simple-to-operate two-button user interface. Note: All battery specifications at 68° F (20° C); lower temperatures and alarm conditions will affect runtime.